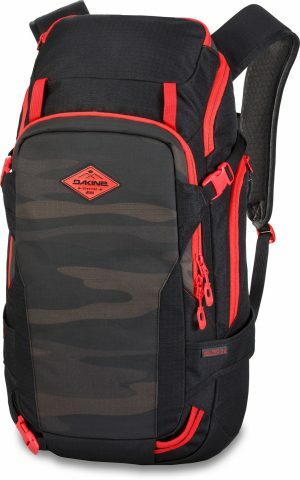 The Dakine Heli Pro 24L backpack is perfect for crossing over from the resort and into the backcountry. With a fleece-lined goggle pocket, back panel access to the main compartment, and a front access pocket designed to hold a shovel and snow tools, you’ll have all the gear you need. When the bootpack gets steep, you can strap skis on diagonally or A-frame and a snowboard on vertically. Diagonal Ski Carry - Diagonal Carry for your skis. Goggle Pocket - With fleece padded pocket for your goggles. Helmet Carry - With helmet carry for your bike or ski helmet. Side Access - Fast access through side access. Vertical Snowboard Carry - For easy transport of your snowboard.